Here at NaturalSociety we’ve covered countless reasons to avoid fast food at all costs. This cheaply-processed food fuels illness and disease due to containing numerous harmful ingredients – some of which are actually banned in other countries. But if you need yet another reason to avoid the junk, here it is: According to a study published in the journal Annals of Diagnostic Pathology, some fast food hamburgers may contain as little as 2% actual meat. For the study, researchers analyzed the content of 8 fast food hamburger brands. To ensure that there was no bias in the results, they assigned each hamburger with an anonymously designated name, ranging from H1 to H8. While it would only logical to assume that hamburgers are made up primarily of meat, much of the 5 billion hamburgers consumed by Americans annually actual contain very little meat (and could contain a whole host of other ingredients. Water content by weight ranged from 37.7% to 62.4% (mean of 49%). Meat content in the hamburgers ranged from 2.1% to 14.8% (median of 12.1%). 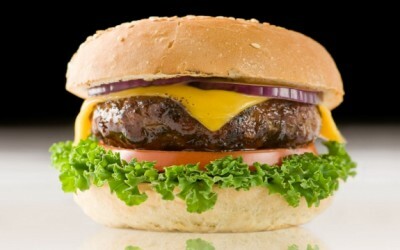 The cost per gram of hamburger ranged from $0.02 to $0.16 (median of $0.03). Relatively preserved skeletal muscle was observed. A variety of tissue types besides skeletal muscle were observed including connective tissue, blood vessels, peripheral nerve, adipose tissue, plant material, cartilage, and bone. In 2 hamburgers, intracellular parasites were identified. Unfortunately, the study abstract nor the 4 pages of the study (you can sign up for free to view the study for 5 minutes) reveal where the 8 hamburgers came from, which most individuals will be upset about (including myself). But the study most likely involved at least some popular fast food hamburgers, leaving you to make your own educated conclusion. In the end, the research simply backs the notion that fast food is questionable at best and health-compromising at worst. The junk food may cost very little, but you truly don’t know what you’re paying for with conventional food this day and age. Fast food hamburgers contain numerous health-damaging ingredients, and is the complete opposite of healthful organic beef coming from grass-fed cows. Avoid fast food; you don’t know what you’re getting into.